100 Years Of Miracles. A Legacy Of Care. In 1918, we embarked on a selfless mission to provide world-class care to all who walked through our doors. Today, this century-old mission is the beating heart that moves Jackson Health System forward. Mission To build the health of the community by providing a single, high standard of quality care for the residents of Miami-Dade County. Vision To be a nationally and internationally recognized, world-class academic medical system and to be the provider of choice for quality care. Values Jackson is committed to providing the best care, with care, for everyone by demonstrating compassion, accountability, respect, and expertise. From The President And Chief Executive Officer Our institution was born in a humble setting but with a monumental task: carrying Miami through a devastating 1918 flu epidemic. The brilliant work done that year by Dr. James Jackson and his colleagues helped define the mission that has carried us through our first hundred years. As we soar into our second century, I would like to think we honor his legacy. Whether it’s taking care of the tiniest newborn babies, performing the most complex organ transplants, treating the most dangerous heart and brain attacks, or supporting our patients’ lifelong management of chronic conditions, Jackson continues to rise to every challenge. Our caregivers work in every corner of Miami-Dade County, from Florida City to Miami Gardens, little of which was even developed when Dr. Jackson’s work began. He certainly would not recognize the next-generation operating suites, imaging systems, and digital health platforms that are part of our daily work, or the innovative academic partnerships we cherish with the University of Miami and Florida International University. Without a doubt, though, he would see our mission as a reflection of his own: serving every Miami-Dade County resident with the same high standard of quality care. Now more than 12,000 caregivers strong, we are never content as simple caretakers of his work — we are, indeed, the innovators who help Jackson constantly grow to match the needs and the dreams of our community’s shared future. Wherever I go in South Florida, everyone has a Jackson story about an injury we treated, a sickness we cured, a life we saved. This centennial celebration is dedicated to every one of those people. A Young Physician Starts A Legacy After the winter of 1895 destroyed Florida’s citrus crops, young Dr. James M. Jackson left his hometown of Bronson, Florida, to start a new job as the Florida East Coast Railroad surgeon for the railroad station in Miami. Disappointed with the dirt streets, shacks, and tents that he saw, he quickly made his way back to the docks to catch the next boat out of town. However, with no scheduled transportation for a few days, Dr. Jackson booked a room in the Miami Hotel to wait. It was during those few days that he met several of Miami’s enthusiastic pioneers, and quickly became infatuated with the town’s spirit and potential. In a letter, he wrote to his wife, “This Miami spirit is a great thing. It is infectious.” He then decided to settle down and be Miami’s physician. On June 25, 1918, the new Miami City Hospital opened its doors to the community in the midst of a deadly influenza epidemic. As a physician and community leader, Dr. Jackson helped Miami grow from a frontier village to a permanent community. While practicing medicine and playing such an instrumental role in the construction and management of Miami City Hospital, Dr. Jackson remained one of Miami’s most prominent civic leaders. He was the first president of the Miami Rotary Club, president of the Dade County Medical Society, member of the American Medical Association, a founder of the local YMCA, president of the state board of medical examiners, and chairman of the Bank of Bay Biscayne. On April 2, 1924, Dr. Jackson died comfortably in his home at the age of 58. A few days later, the Miami City Commission voted to change the name of the 107-bed Miami City Hospital to The James M. Jackson Memorial Hospital. An Ode To Family Legacy All of his life and throughout his medical career, Dr. James J. Hutson, Jr. has watched in awe and admiration as his great-grandfather’s legacy flourished, becoming the world-class institution known today as Jackson Health System. Having devoted his own life’s work to healing as an orthopaedic trauma surgeon at Ryder Trauma Center, Dr. Hutson is proud to walk in the footsteps of his great-grandfather, Dr. James M. Jackson. Thanks to his vision, generations of miracle workers will continue to join the Jackson family for many years to come. 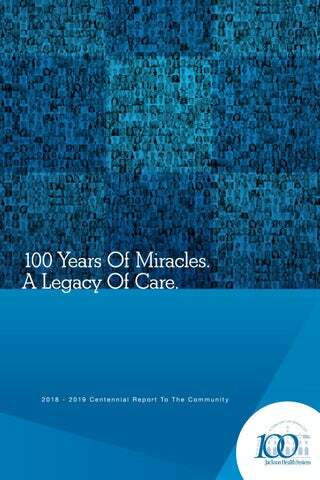 A Century Of Miracles Achieving The Unimaginable In 100 years, we have made our mark in history with some of the biggest medical breakthroughs and life-saving surgeries. These achievements were made possible thanks to the many lives touched by Jackson over time. Without their stories, we would not be the internationally recognized health system we are today. By honoring our past and those who helped to write our collective story, we pave the path for our future. In the wake of “The Great Miami Hurricane,” Jackson cares for more than 700 of the city’s injured. The new Miami City Hospital opens with 13 beds and a handful of employees. The University of Miami School of Medicine becomes the first medical school in Florida and designates Jackson Memorial Hospital as the school’s teaching hospital. 1957 Dr. Robert S. Litwak performs the first open-heart surgery in Florida at Jackson. Jackson helps fight a severe polio epidemic with 95 cases reported in Miami. Jackson provides medical care to Cuban refugees. Nearly 38,000 refugees were treated by 1966. 1924 The Miami City Commission renames the hospital in honor of Dr. James M. Jackson, a prominent surgeon and first president. Jackson treats burn patients with an innovative silver nitrate solution after the cruise ship SS Yarmouth Castle catches fire. Florida’s first tumor clinic opens at Jackson Memorial Hospital. The Miami Training School for Nurses opens. 1933 Franklin D. Roosevelt and Chicago’s Mayor Anton Cermak are taken to Jackson after an assassination attempt on the President-elect. 1966 Plans are unveiled for the development of a 50-acre medical district with Jackson as its nucleus. 2017 2001 Jackson acquires Deering Hospital, which is now Jackson South Medical Center. 1980 UM/Jackson clinicians lead the fight against the AIDS epidemic and create one of 13 national research centers. 1992 Ryder Trauma Center opens just in time to treat Hurricane Andrew victims. 1973 The Public Health Trust is established by the Metropolitan Dade County Board of County Commissioners. 1991 Miami-Dade voters approve a half-penny sales tax increase to support Jackson and allow it to expand its services. The U.S. Army selects Ryder Trauma Center as the only national training center for Forward Surgical Teams. UHealth/Jackson Urgent Care centers open around Miami-Dade County. 2016 Jackson South Medical Center opens a full-service, 24/7, Level II trauma center. 2015 A ceremonial groundbreaking launches the new Christine E. Lynn Rehabilitation Center for The Miami Project to Cure Paralysis at UHealth/Jackson Memorial. The Public Health Trust buys land in the City of Doral to build Jackson West Medical Center. 2006 Jackson Health System takes ownership of Parkway Regional Medical Center, which is now Jackson North Medical Center. 1970 Jackson and the University of Miami launch a joint organ transplantation program, which has grown to become the Miami Transplant Institute. 1986 South Florida’s first adult heart transplant is performed at Jackson. 2010 A catastrophic earthquake strikes Haiti, prompting Jackson’s medical community to respond and treat victims. 2013 Miami-Dade voters approve Jackson’s $830 million Miracle-Building Bond Program. County-Wide Reach As an integrated healthcare delivery system, Jackson Health System consists of six hospitals, a network of UHealth Jackson Urgent Care centers, and multiple primary and specialty care centers throughout Miami-Dade County, bringing world-class care closer to home. Jackson Memorial Hospital is an accredited, non-profit, tertiary care hospital and home to Ryder Trauma Center and the Miami Transplant Institute (MTI), one of the nation’s top transplant programs. With nearly 1,000 licensed beds, Jackson Memorial serves as the major teaching facility for the University of Miami Miller School of Medicine. Jackson North Medical Center serves the residents of north Miami-Dade and south Broward counties and is home to specialized centers, including the Comprehensive Stroke Center, Gastric Sleeve Center, and The Women’s Pavilion at Jackson North. 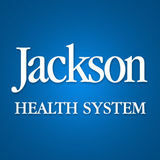 Jackson Behavioral Health Hospital provides a full continuum of care for children, adolescents, adults, and seniors. We also provide a variety of support groups at this facility for patients and their families. Our three-story, 180,000-square-foot facility is designed for maximum treatment effectiveness and success. Jackson South Medical Center offers a full spectrum of services and is staffed by nationally recognized, boardcertified physicians and allied healthcare professionals who practice a wide array of specialties and subspecialties. It is also home to a Level II trauma center. Jackson Rehabilitation Hospital 1611 N.W. 12th Avenue, Miami Jackson Rehabilitation Hospital provides comprehensive rehabilitative care to adults, adolescents, and children while helping patients and their families through the recovery process. We offer a wide array of support services for patients with spinal cord injuries, brain injuries, and a broad spectrum of medical and physical conditions. Jackson West Medical Center The new Jackson West Medical Center campus is under development in the City of Doral. Once constructed, Jackson West will house a diagnostic center, specialty clinics, and an adult and pediatric emergency room. Holtz Children’s Hospital 1611 N.W. 12th Avenue, Miami Holtz Children’s Hospital is one of the largest children’s hospitals in the southeast and is the exclusive home to pediatric specialists who are part of UHealth – University of Miami Health System. At Holtz Children’s, patients from infancy through young adulthood can access breakthrough treatments for complex medical problems often considered untreatable. Call 305-585-4DOC to find a Jackson physician. Miracle Stories From Within As we celebrate our centennial year, members of the Jackson Health System family recall and share their own stories of hope and healing. For many of these compassionate and remarkable individuals, to be a part of something bigger than themselves is what inspires them most, as they contribute to their communities and beyond. Today, Jackson’s team, in collaboration with the South Florida AIDS Network, continues to work diligently in search of new ways to treat and control HIV infection. When the need for personalized care grew urgent in 1986, Jackson was the only hospital to step up and take on the challenge, treating more than 1,600 patients. That same relentless spirit of determination and compassion is what drives our commitment toward finding a cure. Cardiovascular Medicine Always at the forefront of cardiovascular medicine, Jackson Health System provides a full range of cardiac services and rehabilitation with a special emphasis on prevention, diagnosis, and treatment of heart and vascular disease. Our multidisciplinary team consistently paves the path for innovation, offering patients a heightened level of expertise in the areas of interventional cardiology, advanced heart failure, electrophysiology, and other vascular treatments. An Innovative Transplant Center The Miami Transplant Institute (MTI) is a major center for heart transplants and ventricular assist device (VAD) implantations. The story began almost 30 years ago when our specialists performed their first transplant. Today, we perform 30 to 40 heart transplants and VAD procedures annually for adult and pediatric patients, and to date we’ve performed more than 775. Our heart transplant program consistently exceeds national benchmarks for its outstanding patient survival rates. MTI is also a VAD implantation leader, offering a variety of device options with excellent outcomes. Jackson Is Proud To Be A STEMI Receiving Center Time is of the essence when treating someone who is having a heart attack. Jackson North, Jackson South, and Jackson Memorial are part of an elite group of hospitals with a fast “door-to-balloon” time, far below the 90 minutes or less recommended by cardiac societies. This, along with other specific criteria, has earned our hospitals recognition as STEMI (Heart Attack) Receiving Centers. That means our emergency departments meet rigorous standards set by the American Heart Association and the Society of Cardiovascular Patient Care for our capability to rapidly respond to and treat dangerous types of heart attacks. Making History: Florida’s First Open Heart Surgery In March 1957, the first successful open heart surgery in Florida was performed at Jackson by thoracic surgeon Dr. Robert S. Litwak and his team. The entire procedure was televised, marking the medical milestone and propelling further development of the cardiopulmonary bypass, a technique commonly used in coronary bypass heart surgery. By 1960, medical teams were performing cardiopulmonary bypass procedures, thanks to a new heart-lung machine, also known as the CPB pump. Heart Condition Surprises Lifelong Athlete Sheldon Edwards always prided himself on being healthy, athletic, and fit. The Cutler Bay resident played competitive sports in his youth and continued enjoying sports well into his fifties. Then in 2014, his wife found him lying on the kitchen floor, unresponsive. She dialed 911 and while waiting for paramedics to arrive, she performed CPR. Sheldon went into cardiac arrest because of a heart rhythm disorder known as ventricular tachycardia. He was taken to Jackson South Medical Center where Jackson Medical Group cardiologists, Juan Zambrano, MD, and Ivan Mendoza, MD, began caring for him. To treat Sheldon’s condition, Dr. Mendoza used an implant — a subcutaneous implantable cardioverter-defibrillator (SICD) — designed for patients who have survived life-threatening rapid heart rhythms, or those who are at risk. The device helps regulate heart rhythms by providing an electric shock to the heart. Less than a month after the procedure, Sheldon was back to his normal sports routine. Bariatric Surgery The Gastric Sleeve Centers at Jackson North and Jackson South specialize in the laparoscopic gastric sleeve procedure, one of the newest and most successful bariatric procedures. Also known as laparoscopic surgery, minimally invasive techniques enable most patients to recover more quickly and experience less pain. Our two programs have already helped thousands of women and men lose weight and transform their lives. More importantly, the majority of our patients have freed themselves from the dangers and despair of obesity-related conditions like diabetes, high blood pressure, and constant fatigue. 2012 A Center For Excellence: MBSAQIP Accreditation In 2012, Jackson North and Jackson South were both designated Bariatric Centers for Excellence by the Metabolic and Bariatric Surgery Accreditation and Quality Improvement Program (MBSAQIP). In order to achieve accreditation, a bariatric center must follow a rigorous review process to prove that it can maintain certain physical resources, human resources, and standards of practice. Jacksonâ&#x20AC;&#x2122;s bariatric centers were subsequently recognized for best practices and low complication rates. By consistently improving processes, applying multidisciplinary approaches, and elevating our standards of care, we can ensure the highest level of safety with the best possible outcomes for our bariatric patients. At Holtz Children’s Hospital, world-class physicians treat patients from infancy through young adulthood, making miracles happen daily. Holtz Children’s is also one of only three centers in the nation that specializes in pediatric multi-organ transplants, performing two-thirds of all these transplants done in the world. Our pediatric transplant program ranks among the nation’s best survival rates of kidney and kidney-pancreas transplants. No matter the circumstances, our team understands the emotional toll an illness or condition can take on a family. With a family-centered approach to all areas of care, our goal is to make children and their families feel at home during their hospital stay, while providing the support they need. Making History: First Pediatric Heart Transplant At the age of 16, Bruce Brown became Jackson’s first pediatric heart transplant patient. The nearly six-hour operation required the skills of a talented team comprised of University of Miami Jackson physicians, including Dr. Richard Perryman, Dr. Hooshang Bolooki, Dr. George M. Palatianos, and Dr. Eduardo de Marchena. The experience Jackson gained in performing 30 adult heart transplants up to that point was vital to the success of Bruce’s surgery. Today, the Miami Transplant Institute is one of the largest and most comprehensive transplant programs in the nation. Surgeons perform more than 650 transplants each year. As a result, patients from across the globe come to the Miami Transplant Institute for consultation and treatment. only one of its kind in South Florida. Known for its clinical excellence, the Burn Center delivers a comprehensive team approach to caring for pediatric and adult burn victims throughout every phase of treatment – starting with resuscitation and throughout long-term rehabilitation. In the trauma resuscitation area, surgeons and nurses rapidly assess and treat patients to reduce the risk of infection. In most cases, patients are then placed on pain management regimens tailored to fit their needs. Those with severe and life-threatening burns are then transferred to the renowned burn intensive care unit. Additionally, occupational and physical therapists provide rehabilitative services both at the bedside and in the Burn Center’s gym. Along with healing physical injuries, the Burn Center’s team members also help patients cope with their emotional wounds. Psychologists work with burn victims and their families to provide encouragement and teach coping strategies, and support groups also give patients the strength and support to start their new lives as survivors. With nearly 60 years of experience, the Miami Burn Center continues to be the destination of choice for burn patients throughout Miami-Dade County, across Florida, and around the world. Making History: Pioneers In The Prevention Of Hypothermia In Burn Patients In November 2008, surgeons from the Miami Burn Center became the first in the world to use an internal warming method to prevent hypothermia during burn surgery. A 53-year-old male patient arrived at Ryder Trauma Center with approximately 70 percent of his body burned, after a highly pressurized machine used for orange juice pasteurization malfunctioned. In hopes of preventing hypothermia, which occurs in burn patients due to the excessive body heat escaping through the burned skin, doctors used a modified Seldinger technique. They placed a thermal regulation catheter through the femoral vein into the patient’s inferior vena cava – a large vein that carries deoxygenated blood into the heart. The catheter was then connected to the thermal regulation device, and doctors began successfully warming the patient’s core from within. The surgeons who performed this innovative new procedure were Drs. Nicholas Namias, Carl I. Schulman, and Louis R. Pizano, and residents, Drs. Joseph P. Corallo and Booker King. They were the first to publish this successful use. and international level for more than 45 years. Powered by the research and resources of UHealth – University of Miami Health System, and grounded by leading-edge care, it is no wonder MTI has become one of the largest and most comprehensive transplant centers in the world. The MTI transplant team performs more than 650 transplant surgeries annually at Jackson Memorial Hospital, one of the largest public teaching hospitals in the United States. It is also the only center in South Florida that performs all organ transplants for both adult and pediatric patients. MTI is home to some of the world’s leading transplant surgeons, who working alongside a multidisciplinary team, have the unique opportunity to conduct groundbreaking medical research and translate their findings – in real time – to their patients, thus giving new hope where there is often none. MTI patients benefit by gaining access to the newest, most advanced, most effective treatments and procedures. During its long and storied history, the Miami Transplant Institute has delivered world-class care to some of the most medically vulnerable patients in our community and across the globe. Making History: South Florida’s First Liver Transplant Jackie Adams became the first adult liver transplant recipient in South Florida after a 15-hour operation at Jackson Memorial Hospital on October 31, 1987. Jackie moved to south Broward County in 1975 from New York, just a few years before she’d receive the news that her health was deteriorating. By the time she turned 50 in 1983, doctors discovered that Jackie had biliary cirrhosis – a disease that causes scar tissue to build up in the liver and impair its function. At one point, she had more than 25 blood transfusions within six months. Physicians from the Miami Transplant Institute (MTI) at the University of Miami/Jackson Memorial Medical Center determined that a liver transplant was her only chance of survival. Jackie had visited another hospital with an established organ transplant program but chose to help pioneer the liver transplant program at MTI. To date, UHealth – University of Miami Health System transplant surgeons, along with a multidisciplinary team, have performed more than 12,000 life-saving transplants of all organ types and continue to distinguish themselves as leaders through yearly national rankings. Maternity And Children’s Care When families choose to deliver their little miracle at Jackson, they can rest assured knowing they will receive the most comprehensive and compassionate care — for both mom and baby. For many years, our full-service maternity programs — featuring essential prenatal, neonatal, and even pediatric care — have been, and continue to be offered throughout Miami-Dade County at Jackson Memorial Hospital, Jackson North Medical Center, and Jackson South Medical Center. At Jackson, we offer a wide range of birthing options including vaginal birth after cesarean (VBAC). Our specialists in maternal-fetal medicine, neonatal care, and critical care services are always on hand, if needed. If a child has complications or is in distress during or after birth, the expertise of Florida’s largest neonatal intensive care unit is close by at Holtz Children’s Hospital. Many families also find comfort in the parenting support they receive postpartum. Our Baby-Friendly® designation, a highly coveted breastfeeding support standard, demonstrates an optimal level of care for infant feeding and bonding between a mother and baby. At Jackson, we know every baby is a miracle, so we go out of our way to ensure every family receives the special attention they deserve. When Jackson’s current director of the Division of Neonatology, Dr. Eduardo Bancalari, began practicing in 1971, Miami was seeing a higher rate of premature births because of poor maternal nutrition, lack of prenatal care, and an increase in drug use among pregnant women. However, there were very few hospitals in the country that had an established neonatal intensive care unit. In 1973, Jackson Memorial quickly saw the need, and the hospital’s neonatal intensive care unit (NICU), now the Schatzi and Stanley Kassal Project: Newborn Neonatal Intensive Care Unit at Holtz Children’s Hospital, came to be. The NICU opened with seven tiny premature infants with incubators and adapted adult ventilators. At the time, a one-pound preemie had less than a five percent chance of survival. Today, the Holtz Children’s NICU is one of the largest in the country, with 126 beds, 66 of which are Level III for the most critically ill babies. Boasting some of the best survival rates and successful outcomes in the country, the NICU is also known worldwide for its leading research focused on improving and innovating neonatal care. neuroscience team is comprised of leaders in advanced diagnostic capabilities on the cutting edge of technology and procedures. Our neurology and neurosurgery department, in affiliation with the University of Miami Miller School of Medicine, provides care under several specialty areas including stroke services, neurocritical care, neuro-trauma, epilepsy, neuroendovascular surgery, neuro-rehabilitation, pediatric neurology, Parkinsonâ&#x20AC;&#x2122;s disease, multiple sclerosis, and neuro-oncology. We treat some of the most complex neurological disorders and offer our patients the best possible outcomes. Our team of expert physicians is often at the forefront of medicine, leading innovative new procedures to treat patients with various neurological conditions. Our care goes far beyond the operating room. The continuum of care for our neurology and neurosurgery patients often includes rehabilitation with highly specialized speech, physical, occupational, and recreational therapists, trained to help patients with traumatic brain and spinal cord injuries regain their independence. Making History: The Biofeedback Laboratory, Established In 1981 The Biofeedback Laboratory was established in 1981 under the direction of Bernard S. Brucker, PhD, who reported the first successful restoration of function for spinal cord injuries through the application of biofeedback in 1996. Biofeedback is a process in which electronic monitoring of a normally automatic bodily function is used to train someone to acquire voluntary control of that function. Dr. Brucker, who dedicated his career to improving the quality of life for people with disabilities, designed and pioneered many biofeedback techniques used on stroke patients and others suffering from a number of neuromuscular disorders, head trauma, stroke, cerebral palsy, and more. Treatment has helped patients regain the ability to sit independently, perform everyday activities, and even walk. a new Level II trauma center at Jackson South Medical Center. From resuscitation to rehabilitation, we provide a comprehensive continuum of care to the entire community and abroad. The specialized training, experience, and skills of our surgeons, physicians, nurses, and staff are responsible for saving lives and advancing patient recoveries at every stage of the process. Making History: U.S. Army Selects Ryder Trauma Center Ryder Trauma Center at Jackson Memorial Hospital opened its doors just before Hurricane Andrew devastated the community. Less than 10 years later, the U.S. Army selected Ryder Trauma to serve as its only national Army Forward Surgical Team Training facility, preparing military healthcare personnel to provide care to those injured on the battlefield. During two week-long immersions, 20-person Army teams are exposed to combat-like injuries in a high-stress environment â&#x20AC;&#x201D; just as they would face once deployed. Jackson Health Foundation: Compassionate Donors Making Miracles Happen Jackson Health Foundation is the private fundraising arm of Jackson Health System. Established in 1991, the Foundation is governed by a volunteer board of directors committed to implementing philanthropic activities that benefit the medical programs and patient services at JHS. Through the generosity of compassionate donors, the Foundation helps to fill the gaps on major capital projects and programmatic needs that cannot be financed by public bond support. Since its inception, with the support of thousands of donors, the Foundation has raised more than $140 million to help Jackson Health System deliver the best possible care to the community. These gifts have helped to advance emerging research, renovate or build state-of-the-art facilities, and provide accessible healthcare services that enhance the quality of life and health of our community. Members of the Miami-Dade County Board of County Commissioners joined Jackson Health System and Foundation leadership at the ribbon cutting of the new Burn Rehabilitation Therapy Unit in October 2016. Financial support from individual and corporate donors serves as a lifeline for our community and helps to make a positive impact in the lives of family, friends, neighbors, and colleagues. Jackson Health Foundation looks forward to working hand-in-hand with the health system to continue making miracles happen every day. For more information, call 305-585-GIVE or visit SupportJHF.org. Secretary David A. Coulson, Esq. Entering A New Era Of Growth And Progress Launched a decade ago, Medtek Medical Solutions, LLC, a Miami-Dade County certified small business enterprise, had a simple but dynamic goal. The local company was driven to be the leader in providing new and refurbished hospital beds, stretchers, and furniture. Thanks in part to earning work with Jackson as a certified SBE, Medtek has grown its operation from a small warehouse into a 14,000-square-foot facility. Medtek helped renovate the radiology department at Jackson Memorial and is completing a second project at Jackson North. Medtek recently expanded into Broward County and continues to benefit from the goodwill generated by working with SBE partners like Jackson Health System. Our mission at Jackson Health System is to lend a helping hand to our community through excellent patient care. But we also believe that it is important to help in other ways too, which is why we proudly participate in the Small Business Enterprise Program. Through the Small Business Enterprise Program, we are able to provide an open procurement environment, giving businesses in our community a greater chance to gain the experience, knowledge, and resources necessary to succeed. As a part of Jackson’s capital plan, the groundbreaking Jackson Mentor/Protégé Development Program is just as impactful. This innovative program offers Miami-Dade County certified small business enterprise firms the opportunity to be mentored by industry leaders in healthcare construction management services. Through our participation in these programs, we provide opportunities that may otherwise be inaccessible to small businesses while fostering growth and employment within our community. Our Signature Capital Projects Our ongoing expansion and capital improvement projects continue to provide opportunities for local contractors and suppliers. But aside from stimulating growth and employment, each project serves to enhance our medical facilities and improve the quality of health care. Jackson’s capital plan includes new construction projects, the renovation of existing facilities, technology upgrades, highly advanced equipment, and infrastructure improvements. Connecting At The Heart Jackson invests time in special programs for our diverse community. We reach every corner of Miami-Dade through our outreach initiatives, bringing people together in a fun and innovative way while raising awareness on important wellness issues. Jackson Around Town The Miracle Mobile The mammogram mobile unit provides state-of-the-art breast imaging capabilities to the most underserved communities, as well as workplaces and events throughout Miami-Dade County. At an interactive event, the van was rewrapped in a vibrant mural design by members of the community, bringing art to life â&#x20AC;&#x201D; and quality care to women. Other examples of our commitment to the community in the past two years include sponsoring Carnaval on the Mile, supporting the Three Kings Parade, and the Miami Beach Pride Parade, as well as hosting a holiday wellness fair at Dr. Rafael A. PeĂąalver Clinic. From sponsorships to partnerships, we make sure our roots in the community never stop growing. Board Of County Commissioners Miami-Dade County, Florida District 1 – Barbara J. Jordan District 2 – Jean Monestime District 3 – Audrey M. Edmonson District 4 – Sally A. Heyman District 5 – Eileen Higgins District 6 – Rebeca Sosa District 7 – Xavier L. Suarez District 8 – Daniella Levine Cava District 9 – Dennis C. Moss District 10 – Javier D. Souto District 11 – Joe A. Martinez District 12 – Jose “Pepe” Diaz District 13 – Esteban L. Bovo, Jr.
100 years, we reflect on the impact and worldwide. In truth, everyone to be a part of that.